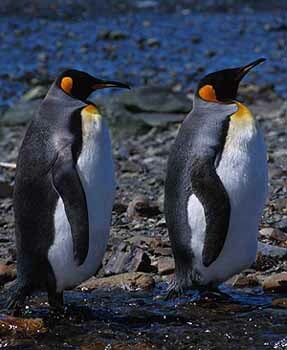 The thought of penguins brings to mind images of "tuxedo-clad" flightless birds standing on the Antarctic ice. But there are penguins at the Equator on the Galapagos; those inhabiting islets off w. South America and feeding in the rich Peru Current are the Humboldt Penguins (left). Penguins are so different from other birds that the 17 closely-related species form their own order, the Sphenisciformes. 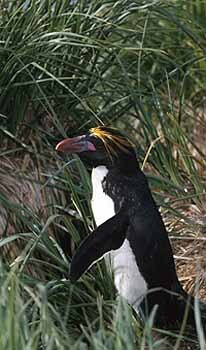 They are the only order of birds that are both flightless and aquatic. I have not yet visited Antarctica, so my experiences with penguins are very limited. Beyond the Humboldt Penguins in Peru, I've seen only the "penguin parade" on Philip I., Victoria, Australia, where sporting-event-like bleachers overlook the sea and the Little (or Fairy) Penguins (below right in a photo taken by my dad) come ashore at dusk in the nesting season, trundling to their burrows to the sounds of recorded narratives in three languages. Penguins are an ancient order. There are 21 genera and 32 species known to science that are now extinct, and they show a much greater diversity in size and shape than the extant species. Penguins are highly adapted for a pelagic life; the body in streamlined with a very short neck and long flat wings used to "fly" underwater, but useless on land. In breeding colonies penguins are very noisy, and calls are individually separable, enabling partners to recognize each other and their chick with certainty (Martinez 1992). The largest penguin of them all, the Emperor Penguin Aptenodytes forsteri, is particularly unusual in egg-laying during the Antarctic winter. Males incubate the single egg on their feet in the interior of Antarctica during the frigid blasts of winter for two months! Surely the highlight of any trip to the Antarctic continent and subantarctic islands are the penguins. I have not yet enjoyed that experience, but my friend Greg Lasley has been a tour leader on several cruises and has been kind enough to allow me to post some of his photos below [more wonderful shots are on Greg Lasley's web site]. I've highlighted three species photographed by Greg which show a good range of diversity in the family: a beachful of Adelie Penguins, a couple of adult King Penguins at a colony, and an adult Macaroni Penguin near its nest. Photos: The Humboldt Penguins Spheniscus humboldti were swimming off the Paracas Pen., Peru, on 12 June 1987. 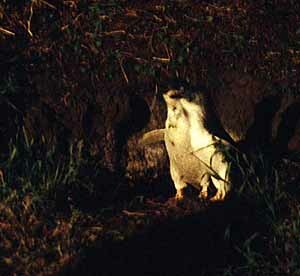 The two Little Penguins Eudyptula minor were coming ashore on Philip I., Victoria, Australia, in Oct 1985 (B.B. Roberson). The remaining photos are by Greg Lasley: Adelie Penguins Pygoscelis adeliae at Browns Bluff, Antarctica, 22 Jan 1999; King Penguins Aptenodytes patagonicus at Grytviken, South Georgia I., on 26 Jan 1999; and Macaroni Penguin Eudyptes chrysolophus at Cooper Bay, South Georgia I., 27 Jan 1999. Photo of Humboldt Penguin © D. Roberson; photo of Little Penguin © B.B. Roberson; and remaining photos © Greg W. Lasley, respectively. Family book: Rating IIII ? Williams, T. D. 1995. The Penguins. Oxford Univ. Press, Oxford. I have not personally seen this book, but it is in the excellent Oxford Press series "Bird Families of the Word," and I have every reason to suppose it is as nicely-done as the ones I have seen (eg, Hornbills). This is an introductory book to the family but is highlighted by Roger Tory Peterson's wonderful photographs of all 17 species and their environment. Roger Peterson was known world-wide for his field guides and his paintings, but his real passion was photography and he had a keen artist's eye. This is an under-appreciated book, and even the brief text gives one a sense of "being there." Further, an excellent introduction to the family is in Martinez (1992). Martinez, I. 1992. Family Spheniscidae (Penguins) in del Hoyo, J., Elliott, A., & Sargatal, J., eds. Handbook of the Birds of the World. Vol. 1. Lynx Edicions, Barcelona.